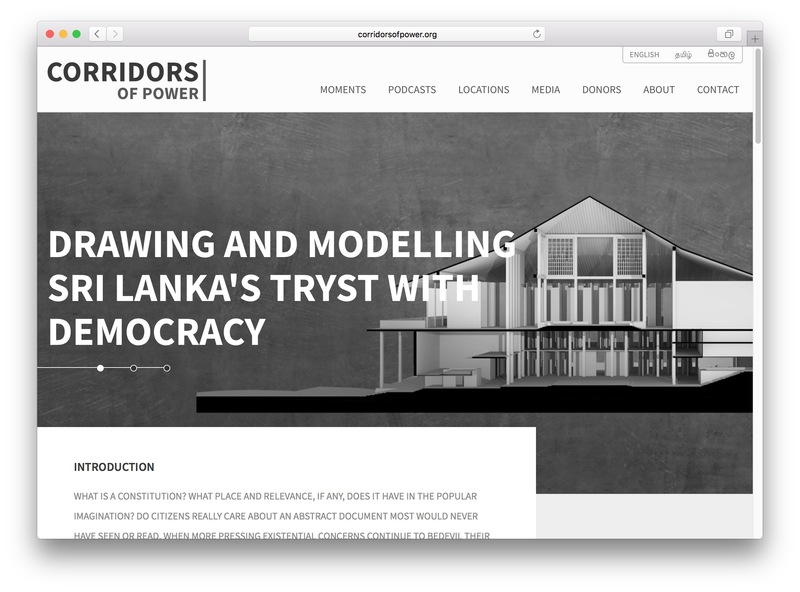 The Centre for Policy Alternatives (CPA) launched a dedicated website for the international award-winning ‘Corridors of Power’, a path-breaking project marrying constitutional reform and theory with architecture. The project was selected as a finalist in Fast Company’s World Changing Ideas 2017 awards, under the Urban Design category. Access the archive of the site here. Conceived of and curated by Sanjana Hattotuwa working in close collaboration with leading constitutional theorist Asanga Welikala and renowned architect Channa Daswatte, ‘Corridors of Power’ through architectural drawings and models, interrogates Sri Lanka’s constitutional evolution since 1972. The exhibition depicts Sri Lanka’s tryst with constitutional reform and essentially the tension between centre and periphery. The exhibits include large format drawings, 3D flyovers, sketches and models reflecting the power dynamics enshrined in the the 1972 and 1978 constitutions, as well as the 13th, 18th and 19th Amendments. The exhibition premiered late 2015, was taken around Sri Lanka in 2016 and will also be taken to key cities over the course of 2017. To our knowledge, nothing along these lines has ever been attempted or created before. The idea is also a model for other country’s to interrogate, through participatory design and visualization, what their citizens think of constitutional rule. This entry was posted in Corridors of Power. Bookmark the permalink.